Each school has a uniform bank where families who are in-need can receive new or gently used uniform pieces. To obtain access to the uniform bank, please speak to your school building leader if you are in need of uniform support for your student. In instances where a student is required to change to participate in physical education class (Middle/High School), s/he must wear required physical education clothing required by school. All garments worn for PE must be neither revealing nor suggestive and must be free of offensive and/or inappropriate logos, iron-ons, emblems, pictures, decorations, and/or words. There are no special requirements for dress for elementary PE classes other than appropriate shoes (sneakers). Girls should have shorts, tights or leggings underneath their jumpers/skirts. Clothing worn for PE class must be hemmed and are to be free of holes, slits, frays, studs, rivets, sewn-on loops, and ties (unless tie is used to secure bottoms at the waist). Student(s) may bring sneakers from home to wear during PE classes. These shoes do not have to follow dress code requirements as long as they are worn during the PE class only. 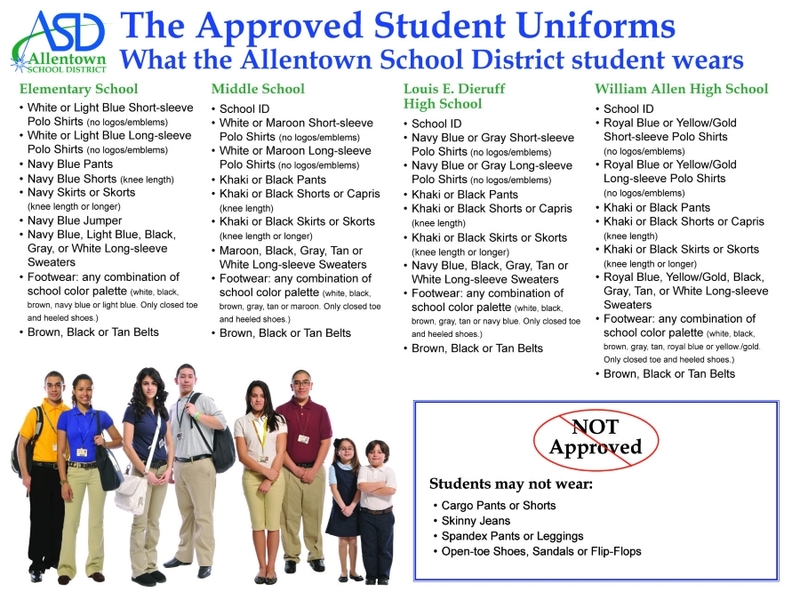 Upon enrolling in the school district, new students should immediately receive uniform guidelines. If parent(s) or guardian(s) indicate a financial hardship in compliance with uniform guidelines they should be given an application for financial assistance. Schools should make every effort to support family, including utilizing items in uniform bank.